A competent blastocyst and a receptive uterus are two critical components for successful embryo implantation. Currently, mouse models are the most powerful tools to understand mechanisms by which acquisition of uterine receptivity takes place. Based on the previous studies performed by us and others, pre-receptive stromal proliferation and epithelial differentiation regulated by ovarian hormones, which we call endometrial proliferation-differentiation switching (PDS), can be a potent marker of uterine receptivity. Molecular interactions between the uterus and the blastocysts, which are followed by the acquisition of uterine receptivity, allow the subsequent implantation processes such as attachment reaction and decidualization. 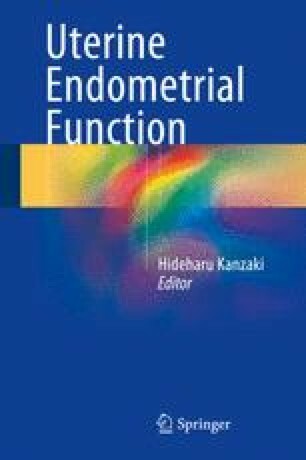 This chapter shows detailed molecular mechanisms for successful implantation, focusing on uterine receptivity and referring to the mouse in vivo evidence. This work was supported by JSPS KAKENHI Grant (Project Numbers: 24689062, 26670713, 26112506, 26112703, 40598653), the Cell Science Research Foundation, and GSK Japan Research Grant.